A large palampore replete with exuberant decoration, depicting a majestic tree with branches spreading towards the sky and blooming with fleshy and plump red, indigo and mauve flowers. The striped-trunk tree is divided into three sinuous main branches that fill the main field of the palampore, and originate smaller branches rich in lavish foliage, flowers and fruits. The variety of the floral elements is truly astonishing, and dominates the surface with flowers of different shapes and sizes, succulent fruits and undulating leaves that allow almost no empty space to be seen. Surprisingly great numbers of animals have found their place in the scene, such as birds perched on the branches, or a panoply of animals that populate the rocky mound at the base of the tree. The birds are probably parrots or parakeets, and can also be seen in groups resting upon the mound and along the wide border of the palampore, which is also decorated with floral motifs. The rocky mound, in the chinoiserie style, is fantastic in and of itself, with great formal diversity. We can see serrated or circular shapes, grids and spirals that create rich patterns contrasting with the flame-like roots of the tree, and which surround the flowers, animals and even human figures present. Rabbits, felines, deer and hunters take their place in this fascinating landscape, where a sense of natural scale gives way to the energy and expressiveness of all the life around. 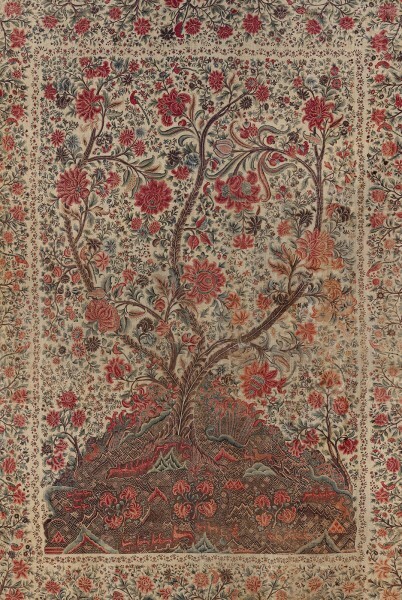 Although produced in the Coromandel Coast in India, palampores sometimes reflected European taste, and their decoration, typically with a central Tree of Life laden with fruits, flowers and birds, combined patterns from English embroideries, Dutch and German herbals, Chinese decorative objects, Persian miniatures and the Indian textile tradition. Palampores were therefore a product of the intense economic and aesthetic interrelations between East and West. It has also been noted that the trees seen on palampores took on a distinctly Chinese characteristic after about 1760, largely as a result of the vogue for Chinese wallpapers with similar designs (Crill). The present palampore does not show such distinct Chinese influence, and can therefore be dated to circa 1760 or earlier.